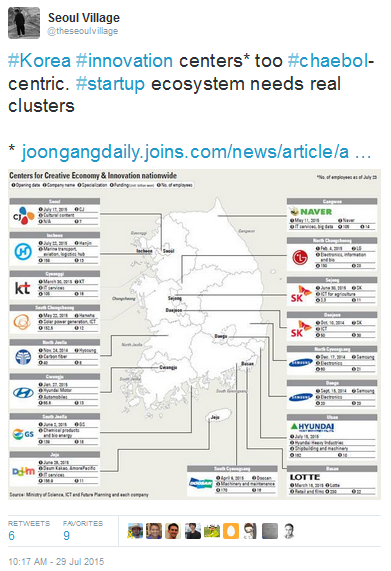 This map shows what's wrong with innovation in Korea: each "Center for Innovation and Creative Economy" is led by one chaebol, but the startup ecosystem demands actual clusters* and truly open approaches. 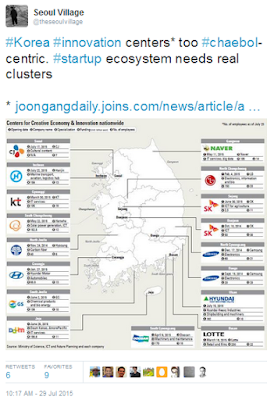 The contradiction is obvious, but the Korea JoongAng Daily article this map came from ("Outside Seoul, new centers have a sleepy feeling" - 20150729) doesn't even mention it as a reason why these centers fail, like all attempts from previous administrations. Again (see my essay on "Heralding cultural diversity - a stronger and more sustainable Korean wave" - particularly part III, on the business dimension), the chaebol seldom act as true cultural leaders, and that's a drag for the nation. Yet change is coming to Korea. In spite of the inability of most chaebol to truly adapt, and of governments to push for true reforms. And if these changes are not necessarily positive, they make Korea Inc.'s posture even less sustainable. As expected (see "The Bigger, The Bitter"), the money recently poured over the nation by Google and many major international V.C.s to put a lock on the most promising startups is at the same time fueling the local and global bubbles, and weakening the chaebol sphere of influence. Now being the only new kid on the block isn't enough, and the time Yellomobile could purchase dozens of startups for a song has ended. One of the most positive side effect could be the evolution of mindsets towards enterpreneurship and startups. The fear of failure, a major impediment to innovation in Korea (see "Too proud to fail? Not so simple. "), is on the vane. And that's not just blind belief in the latest tech bubbles: more among the nation's brightest students prefer to give it a try rather than join Samsung and Co. even if they know chances are not on their side. They welcome failure as a positive experience, and they know that it's better to start with it, that they will learn more during these 'wasted' months or years than by following the mainstream lemming race. Now Korea also needs a couple of greatly successful failure stories, and a fairer balance between the conservative and the disruptive. I'm feeling certainly more optimistic than a couple of years ago, and I've met more than a few young brilliant minds trying promising things. They know they can't expect much from the big fishes or from the government, but it wouldn't hurt if said big fishes and said government actually decided to prove them wrong. (intitially published on SeoulVillage.com as "Non-Centers = No Innovation, No Creative Economy"